It seemed only a matter of time before geek-centric 80’s-90’s tribute films became its very own genre of film. And this film carries the mantle well. I can think of at least a dozen 80’s or 90’s films and TV shows that seem like inspiration for this film, but that’s part of the charm and part of what makes this genre what it is. But there’s even parallels to some of the biggest films of 2015 that makes it well suited to its year of release. There’s a “Mad Max” style apocalyptic setting complete with skull mask and shoulder pad wearing crazies who, comically, ride around on bicycles rather than the more menacing motor vehicles. And they terrorize the gruff, barely sane people of the community where our main character lives. He’s known only as The Kid (Munro Chambers), and he spends his days scavenging the areas of the wasteland that are known as the safe zone. Much like Rey in “Star Wars: The Force Awakens,” he brings whatever treasures of value he can find in the dusty wasteland back to trade for survival essentials like food and water. Much like “Mad Max: Fury Road” there’s a water shortage and the primary villain controls most of the water that remains. The villainous Zeus (Michael Ironside) commands his gang of crazies to kidnap victims with which to murder in order to create most of their water, because of course, the body is mostly made up of water right? The call to action that forces The Kid to fight against Zeus comes after a brief meet-cute in which The Kid befriends a goofball girl named Apple (Laurence Leboeuf). Though we come to find out she’s a robot, which explains why she is the way she is, initially her wide eyed wonder comes off as crazy, but soon endears her with a sense of child-like innocent. To their credit, François Simard, Anouk Whissell and Yoann-Karl Whissell never portray Apple as the damsel in distress. She might not quite understand the perilous situations she finds herself in, but we get the sense she could take care of herself if she needed to. In fact, she teaches The Kid more about fighting than he’s ever learned by roaming the wastes by himself. When she’s captured by Zeus’ gang, The Kid barely escapes by accidentally falling into some sort of fallout shelter where he finds a set of armor and a powerful gauntlet that he recognizes as belonging to his favorite comic book character 'Turbo Rider.' He has to fulfill his lifelong fantasy of becoming the plastic armor clad, comic book hero he’s grown up reading about in order to save her. Once he does rescue her, in a scene full of goofy gory violence meant as much to play for humor as for thrills, they realize that Apple’s battery is draining and she’ll die if they don’t find a way to scavenge the necessary robot parts to fix her. Yet their perilous journey quickly becomes more dangerous when Zeus sends his gang to hunt them down. With the help from a gruff, arm wrestling cowboy, Apple and The Kid must defend themselves against Zeus and his gang while trying to beat the clock to the robot scrapyard. This post apocalyptic setting, in the year 1997, features the sorts of aging technology that kids of the 80’s and 90’s will remember all too well. From his scavenging travels, The Kid collects a vast array of cassette tapes, VHS tapes, comic books, and the View Master which he is all too sentimental about. Whatever he can’t sell, or doesn’t want to give up, he stores in his small hideaway. It’s the ultimate retro hangout that even the main character from “Ready Player One” would fantasize about. Munro Chambers gives a solid performance as The Kid, who is the only sane person in this apocalypse. The Kid's backstory is slowly revealed over the course of the movie and it grants him even more motivation for battling the film's villain. It's also worth noting that Chambers bears a striking resemblance to a young Ryan Reynolds. Laurence Leboeuf turns in a performance that is pure camp as Apple. In fact, it’s campy enough that she wouldn’t feel out of place in the 60’s Adam West “Batman” series, but she’s so innocently good spirited, and genuinely fearless that she’s actually surprisingly charming. The action choreography is painfully ametuer, but they try to make up for it with some pretty well done practical effects, even if they’re in service of the film’s ridiculously over-the-top gore comedy. It also, however briefly, explores themes of humanity against the robots they created that feels obviously borrowed from “Blade Runner.” Le Matos’ musical accompaniment is a glorious 80’s inspired synthwave soundtrack that elevates nearly every moment. It may be a fun bit of retro-sandbox filmmaking, but the indicators that would suggest a target audience seem continually at odds with each other. 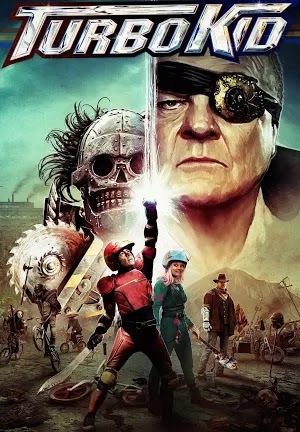 It’s called “Turbo Kid” and features two young, lead actors, but it’s laden with references to a specific time period that younger audiences aren’t likely to appreciate. And of course, the film features enough bad language and over the top, gory violence that it’s clearly not meant for family movie night. However, there is value in escapism, and this is a rare film that caters to making young adults, who are the real target audience, feel like kids again by its ability to conjure a specific time period and the collection of genres that made it so memorable. Despite it’s poorly written dialogue, campy performances, and juvenile action-gore, I simply couldn’t stay annoyed with this film for long. Every misstep, including a final act that goes a bit off the rails even for such a light-hearted sci-fi comedy, remains mostly forgivable simply because the sheer joy of "geekdom" has a way of prevailing. Thus there will always be a place for the likes of this film. This relatively new, geek-centric genre is set to explode in the relatively near future when Steven Spielberg adapts “Ready Player One” for the big screen. It’s likely to be the biggest budget, and by far the most mainstream film the genre has seen yet. And it certainly won’t be the last. Perhaps we’ll remember this little film for the modest hand it’s had in pioneering this film movement.